XLRI- Xavier School of Management recently hosted ‘Teach India; Reach India’ – National Colloquium on School Education. At the event launched a unique leadership and management programme for school teachers currently in or moving into leadership roles. Conceived by CeRTEL (Centre for Research, Training, Education and Leadership), XLRI, one of XLRI’s reach out programmes aiming at enhancing the teaching/learning experience in the schools of India, the new programme – PG Certificate in Applied Educational Leadership and Management in collaboration with Fordham University, USA aims at enhancing the effectiveness of the teaching community by improving their support structures and the domain and managerial competence of its care givers. This Specialized Year-Long Online Course has been carefully designed with the objective of improving leadership administration in the emerging educational contexts; acquire and adopt the right leadership style for managing change; keep abreast of research & educational practices that enhance teaching and learning; enable a deeper, critical understanding of the organization, and the environment we operate in; and, grow and develop along with colleagues, organization and stakeholders. The program’s curriculum includes sustained input, job-embedded activities, collegial discussions, and hands on project and is designed to provide participants with practical educational leadership skills. The course module spread across 12 months is divided into 4 modules and 15 courses. 10 of these courses will be delivered online in D2D (Desktop to Desktop) mode and the remaining 5 in workshop mode at XLRI campus. The training mode is to follow Blended Learning format, comprising – Knowledge component through Lectures; Skill component through Workshops; and Competence building through Projects by experienced professors of XLRI and other renowned institutes along with faculty from Fordham University, USA. “This blended learning is designed for those from any of the Boards of Examination who seek to understand and enhance the teaching/learning climate of their staff and students for improved organizational performance, quality, customer satisfaction, effective management and control, and therefore financial stability resulting from managing and developing people well,” Dr. Francis Peter, S. J. further added. The day-long Colloquium which was held at XLRI Campus, Jamshedpur on 29th April, 2017 saw around 50 educationists, practitioners, Principals, various heads of chain schools, policy makers, representatives from NGOs, publishers and other stakeholders in school education brainstorm on key issues relating to education in an effort to find common ground where they can work together to bring about positive changes in school education in India. 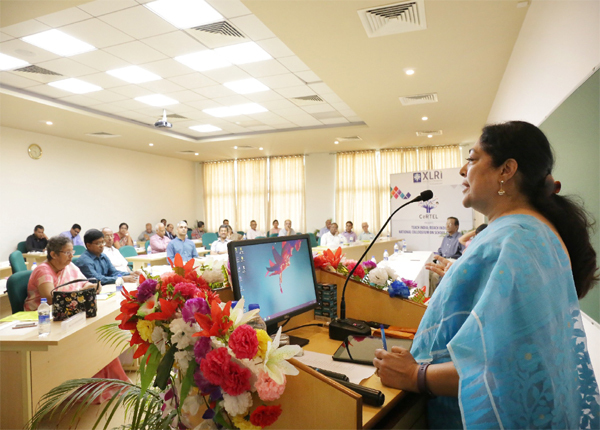 The theme talk of the event was delivered by Mrs. Ruchi Narenndran, Managing Trustee, Education Office, JUSCO at the inaugural session. In her address, Mrs. Narendran emphasised on the needs for the teachers and educationists to be able to learn unlearn and relearn. “The demands of the job market today are very different from what it was a decade ago. Today we meet to teach our students to work collaboratively, to be self-starters, to be able to work with different cultures and above all to work with integrity. We also need to teach children to be able to sift through the vast ocean of data available, to interpret it in the right way anduse it appropriately. Teacher training and retraining is the need of the hour. This is an area which needs urgent attention and quick action,” she said. She also spoke about TATA Steel’s 1000 school program being run in Orissa which works very hard to bring about tangible improvements in school education in the state. Delivering the welcome address at the event, Dr. A K Pani, Dean [Academics], XLRI stressed on the need for teachers’ development and revamping of the curriculum to make education more appropriate in the current scenario. The day long programme comprised of various events including group works, panel discussions, and sharing of best practices by the participants. Dr Sanjeev Varshney, Professor, XLRI, presented a white paper on The Status of School Education in India Today. The session on sharing of best practices saw participants share their innovative experiments on best practices which worked for them. The session also included a brainstorming group challenge where the members had to work out an innovative action plan for future direction. “At the end of the Colloquium, what emerged was the need for competent, qualified and focused teachers in order to reform and revamp the education system within the given context. Vocational training must be made an integral part of education to make it all inclusive. A level oriented education system was proposed as one of the possible future actions. Education should not be prescribed: on the other hand, it should allow a student to explore himself/herself,” observed Dr. Francis Peter, S. J. about the event.